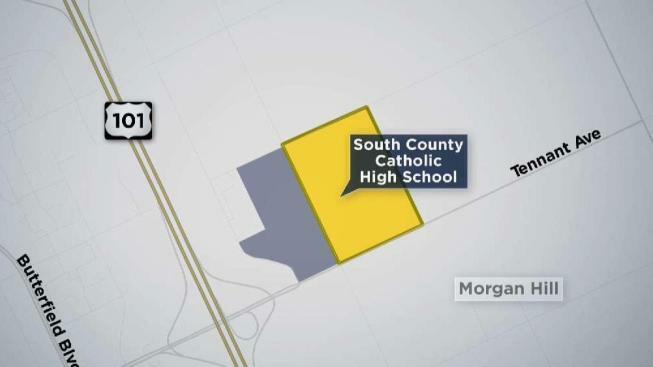 The Catholic Diocese of San Jose wants to build a new high school on an open plot of land just outside Morgan Hill city limits, but several times the plan has been shut down by a state-mandated agency intended to prevent urban sprawl. Kris Sanchez reports. Approval for annexation can only come from Santa Clara County's Local Agency Formation Commission (LAFCO). The state-mandated agency, which is intended to protect open space and agricultural land, prevent urban sprawl, and promote efficient service delivery, has said no to several prior development plans. According to the city of Morgan Hill, which witnessed its city council vote to take the annexation application to LAFCO once again this month, this time is different because the diocese proved that annexation is the only way to build a high school because there is no available plot of land within the city large enough for a school campus and because the diocese is committing to preserving agricultural land. "What we’re offering is is a one-to-one mitigation," Father Steve Kim, the bishop’s delegate for school construction, said. "For every acreage of land that we build for the children, for the students, we’re going to preserve another acre to keep it agricultural." LAFCO won't comment until it receives the plan but will likely take the issue up at its December meeting.